Vermont Public Radio led off its Wednesday afternoon newscast with a bit of a bombshell: Sen. Bernie Sanders (I-Vt.) is running for reelection in 2018! Wow, I thought. Did Bernie make an announcement that I missed? Did VPR have some red-hot inside information? Well, no. Sanders has not, in fact, declared his intentions for 2018 or any other year, for that matter. VPR's report, a condensed version of a piece by veteran journalist Bob Kinzel, was based entirely on the text of an email sent Tuesday by the Sanders campaign. The email announced a multistate tour by Sanders during the current Congressional recess. It wrapped up with a fundraising pitch: "Please make a $27 contribution to my reelection campaign to help fund this national tour." It's possible to interpret that as an announcement — sort of. But here's the thing: Officeholders are constantly raising money for reelection campaigns that may or may not actually happen. Fundraising begins as soon as the last campaign ends. There are practical reasons for this: there are always political activities that require staffing outside of a lawmaker's taxpayer-funded office, modern campaigns require a lot of infrastructure building that can't be left until a formal announcement, and in an age of big-money campaigning, an officeholder needs to be constantly raising money. Sanders' email didn't escape notice in the Seven Days newsroom. But we didn't interpret the email, by itself, as a real announcement. We reached out to Sanders' office seeking clarification of the senator's intentions and posing other questions as well. Kinzel had done the same. "Numerous attempts to talk to Sanders or members of his Senate staff were made and went unanswered before publication," he reported. But he still filed his report announcing that Sanders had launched his candidacy. The full piece didn't air Wednesday, according to VPR's deputy news director Annie Russell, but the newscast item was read. VPR policy bars reporters from discussing their stories with other outlets, so Russell spoke for Kinzel. "The email said 'donate to my reelection campaign,'" Russell explained. "Bob followed up multiple times. He made it clear what he was asking about; nobody told him 'Wait, that's not true.'" Again, Seven Days interpreted it differently. But the Sanders camp could have prevented all this by simply doing its job — communicating with journalists. As usual, it failed to do so. Sanders' office did, finally, belatedly, issue a statement — at 10:10 p.m. Wednesday night, hours after the airing of VPR's newscast item. The statement, issued by Sanders staffer Daniel McLean, was an exercise in blame-shifting. 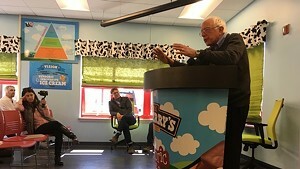 "Vermonters and the American people have just come through a never-ending campaign which ended all of five months ago," he wrote. "I would hope that the media would focus on the extremely important issues facing our country instead of endlessly speculating about the next election and who is running for what." Okay, that's just shameless on multiple levels. First, the guy who's been campaigning almost ceaselessly since Election Day is complaining about the perpetual campaign? I mean, really: He's asking his supporters to bankroll a campaign tour. It's a campaign of ideas, not personal candidacy — but it looks like a campaign, walks like a campaign and quacks like a campaign. It's a campaign. Second, the media are not acting in a vacuum. Plenty of Vermonters would like to know about his plans. I'm sure the leaders of all three major parties, as well as prospective candidates, would like to know if he's running. Sanders' plans are clearly a matter of public interest. There's another oddity in play which, if this were anyone but Sanders, would be a matter of some debate. 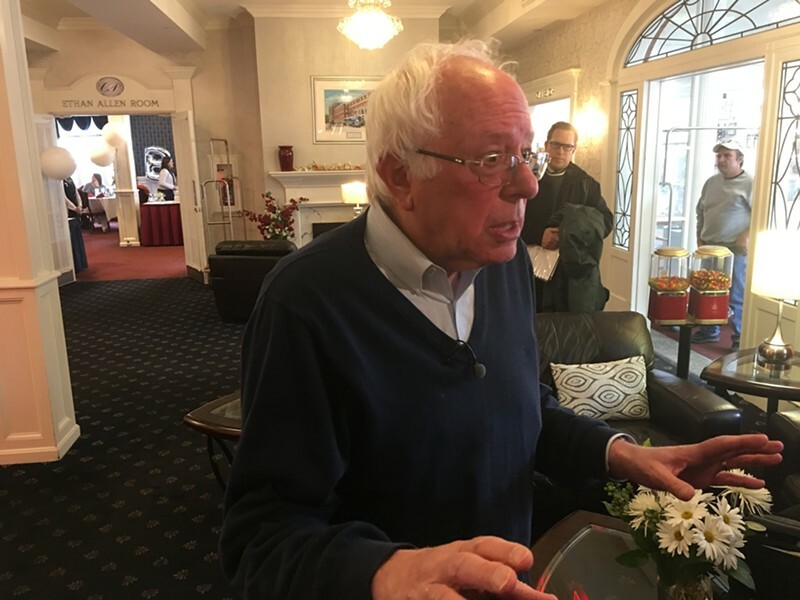 Sanders is raising money for his reelection campaign fund — and using it for a multistate tour that does not include Vermont. There's nothing illegal about this. Candidates and officeholders enjoy broad latitude in spending campaign funds. If Sanders wants to use his reelection war chest on a rally in Utah, he's free to do so. For that matter, if Sanders decides not to run for reelection in 2018, he can roll the unspent funds over into another campaign — for him, or for anybody else. Which is why Kinzel's original story was overblown at best. VPR did walk back its "running for reelection" assertion with an 11:57 p.m. Wednesday clarification amended to its original story. Kinzel's rewritten story was scheduled to air Thursday afternoon; the text is already available online. This isn't the first time Kinzel has done this exact thing. In February 2015, he wrote a virtually identical story about Sen. Patrick Leahy (D-Vt.), interpreting a fundraising appeal as a reelection announcement. The Leahy camp reacted sharply, claiming that no decision had been made. Russell could say nothing about the decision process in that case, or whether that experience had any impact on the process regarding Sanders. "I was not involved with the Leahy story," she said. "I can't speculate." Nor could she allow Kinzel to elaborate. Russell also pointed out that WCAX-TV had made a similar report. WCAX's story was published more than three years earlier, after Leahy made an exuberant remark at the Vermont Democratic Party's election night celebration in 2012. Leahy, of course, did go on to run, winning another term last November.